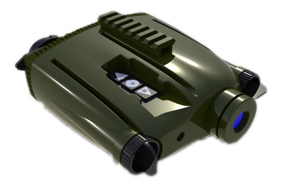 Sauter Industrial Design was founded in 2007 by Ken Sauter, who has designed three night vision sights used by the military (AN/PVS-8, AN/PVS-10, AN/PVS-24). Ken has 37 years of experience doing design work on everything from truck bodies to night vision equipment for the Military. For the past few decades, complex optical systems and elaborate electronics have made up the bulk of his work. Ken has developed healthy and productive relationships with the vendors that produce his designs and considers those relationships extremely important to getting his clients' designs produced in the best and most inexpensive way possible. Ken believes in building long-term relationships with both vendors and customers and makes it a point to keep those relationships healthy. Price is important, but not as important as getting the most value for your money. It is more important to get your project designed and produced properly so you don't have to do it over. Your customers appreciate a design that works the way they expect it to and is priced accordingly. Happy customers are priceless. We believe that you know more about your idea and what you want to do with it than anyone else. It is our job to translate your idea into a producible form that satisfies your requirements. We do our level best to design exactly to your specifications-no more, no less. We believe design is a cooperative effort between the designer and the customer. We also understand there may be aspects to your design that you haven't thought of or need help with. We help you think through your idea to make certain it addresses all of the things you want it to, even those you may not have thought of. Our job is to help you accomplish your goal of developing a product that you are pleased with. We firmly believe that unless you are completely satisfied, we have not done our job properly. We want you to be so happy with the work we do for you that you come back to us every time you need a product designed. The happier you are, the better we do. Persistence: we will finish the job you give us. We make certain we understand the job up front, and we are committed to finishing what you pay us for to your satisfaction. Organization: lack of organization can cripple the best design effort. We understand the design process and apply resources where needed at the right time in the process. Every design job has three stages: 1.) concept, 2.) layout, and 3.) detail design. Each step requires a somewhat different approach, and checking, or gate-keeping, is always a high priority in a well-developed design process. Reliability: you can count on us to respond promptly to your phone calls and e-mails, and our work will be as thorough and complete as you want it to be. You won't get nervous about the quality of our work, and we will be there for you when you need us. Quality: we understand the design process, and what it takes to create a top-quality, producible design with a minimum of problems. We have a system to do that and we use it. Commitment: We understand that there are always problems in getting a new product into production. Our commitment is to be there for you, providing design support and resolving problems, until your design is in production or until you are completely satisfied with the design we deliver.